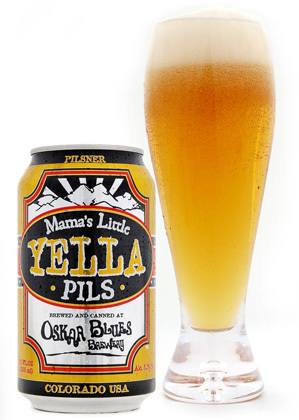 Oskar Blues Brewery is now releasing Mama’s Little Yella Pils in sixpacks of cans. Cans (and kegs) of the beer are now appearing at beer retailers in Colorado and the brewery’s other 22 states. This new canned beer from the pioneering microcanner is a delicious, small-batch version of the beer style that made the city of Pilsen (in Czech Republic) famous. Mama’s is made with hearty amounts of pale malt, German specialty malts, and a blend of traditional (Saaz) and 21st century Bavarian hops. Unlike mass-market pilsners, Mama’s is made of 100% malted barley and no corn or rice. Oskar Blues’ first canned lager, Mama’s Little Yella Pils is fermented at cool temperatures with a German yeast. It sports the trademarks of a classic pilsner: aromas of grassy Saaz hops and pale grains, flavors of pale malts backed by subtle Euro-style hopping, followed by a crisp and refreshingly hoppy finish. While it’s rich with Czech flavor, Mama’s gentle hopping (about 35 IBUs) and 5.3% ABV make it a satisfying but lower alcohol beer (by Oskar Blues standards) that’s perfect for warm-weather drinking. Since its start, Oskar Blues has blazed its microcanning trail with higher-strength, assertive-but-elegant beers that stretch beer boundaries. But Mama’s Little Yella Pils allows the brewery to highlight its skills in making a more subtle version of great beer. I was lucky enough to score a six pack last weekend. This may become my goto summertime beer! The beer was crisp, light and went down smooth. I tried it this weekend and looooved it. Smooth is the word man and addictive. This is one of the best pilsners I have come across. They are local to where I am (CO) so I’m lucky to have it as an option in most liquor stores. As they state on their site, this is what the American shelves should be stocked with. Sweet aroma + just enough hoppiness to remind you its a PIls. Oskar Blues doesnt really make a bad beer. If you want to splurge a little (and you can find it), try the Gubna – a super-hoppy, imperial IPA, with a 10% ABV explosion if deliciousness.